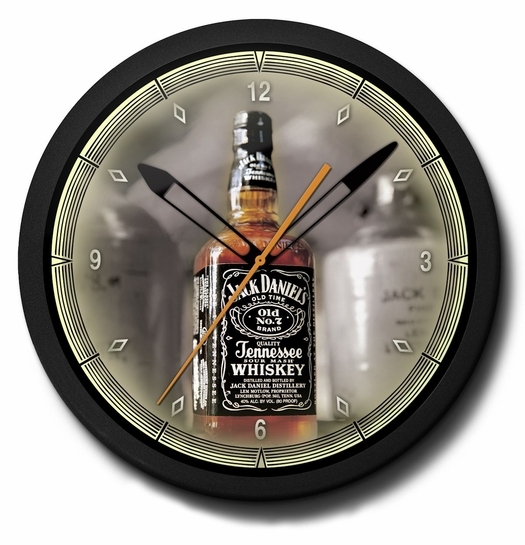 The 20 Inch Jack Daniels neon clock is a striking time piece. Its forefront is the classic black labelled Jack Daniels bottle with its colorful content against a grayed background of the whiskey manufacturer�s past designs. The image is fleshed out with an orange smooth motion sweeping second hand, dark hour and minute hands, and a distinct numbering design. It has a long lasting half-inch neon tube that accents the entire face. This beautiful time piece will look great over the bar at home or the sports bar or pub. It would also be a great asset to your man cave, garage or any stressful environment where you not only keep looking up at the clock, but need a reminder of what awaits at the end of the day! Of course, Jack Daniels is the world�s best-selling American whiskey. Produced in a distillery in Lynchburg, Tennessee, its design is one of the most recognizable on the spirits shelf. The name has easily become a distinct part of Americana. Everyone from Jack Nicholson to John Belushi to James Bond have indulged on the big screen. This whiskey has been referenced in far too many songs to list here. Singer Dean Martin mentions Frank Sinatra�s love of Jack Daniels in his song I Love Vegas. And Sinatra did indeed. In 1998, Ol� Blue Eyes was buried with a bottle of Jack Daniels Old Number 7. He would�ve loved the Jack Daniels neon clock too. With a hand spun body of aluminum bezel, the time piece has a powder coated finish. That glow promises to last over 11 years. Thats over 100,000 hours. The glow is controlled by a switch on the clock bezel. The clock itself is also powered by AC. Having the Jack Daniels neon clock on your wall will always be a sweet reminder of what awaits. Ask a question about Jack Daniel's Neon Clock: High Quality, 20 Inches.